The 4th of July kicks off summer for most people. If you are planning a together, check out this fun Patriotic Sweets and Treats that your guests, especially the little ones, will love! Or if you are attending one, bring along one of these treats! They’ll surely be impressed. If you like to keep it on the healthy side, fruit is really fun to work with, especially with the colors red, white and blue! Sizzling Eats shared these really cute Patriotic Candy Apples and Madame Deals shows you how to make Easy Patriotic Stawberries. I’m always happy when I see a fruit pie at parties. Try this Patriotic Mini Fruit Pizzas from Shaken Together. I love the idea of individual fruit pizzas, and these would be fun for he kids to create themselves! I love trifle and there really is a lot you can do with it. The Girl Who Ate Everything made a fun looking Patriotic Trifle that would make a cute centerpiece too! Cakes and Cupcakes are always a hit at any party. I know very few kids who don’t eat cake. Cupcakes are fun to decorate not just with frosting, but with toppers! Home Made Interest shared these adorable Red, White, Blue Cupcakes in a Jar. These are fun!! Plus you get to eat two cupcakes and not feel bad about it! Berries and whipped cream seem to be a theme when it comes to cupcakes. Snappy Gourmet made these Berries and Cream Patriotic Dipped Cupcakes. I love the idea of dipping the cupcakes in chocolate! I bet these are delicious! Lil Luna made these really fun Candy Fireworks Cupcake Toppers that the kids are going to love!! If you aren’t as crafty in the kitchen then try these Firecracker Cupcakes from Inside Bru Crew or Oh Nutes version of Firecracker Cupcakes for the Fourth of July. If you just want to decorate the top of the cupcakes or cake with something fun, check out Elegance and Enchantment. She made some super cute 4th of July Cupcake Flags and Studio DIY have these fun DIY Firecracker Cake Toppers! Cookies are always a hit with all the kids in my neighborhood. Plus I love cookies too! These Gooey Butter Blue Velvet Cookies from Lil Luna are easy to make and look good! I love making cookies from cake mix, they really are delicious! These blue ones are perfect for the 4th of July! Cookie cups are fun! If you haven’t made them, you must. They can be filled with all sorts of yummy things. Check out what Shaken Together put inside her Red, White, Blue Cookie Cups! Sizzling Eats shared these Red, White, and Blue Fire Cracker Patriotic Sugar Cookies and of course they look great. I’m sure they would be a big hit! You can change this for every holiday with different colors! There are so many other great treats that can be made with Rice Krispies, Cheerios, Pudding , Marshmallow and more. Check the list below. And if you are looking for a fun drink, Oh My Creative made this Star Studded Fourth of July Drink . Which one of these Patriotic Sweets and Treats are you going to make? What fun and creative recipes! I will for sure be making some of these for our 4th of July festivities! Thank you for sharing this. I would like to make patriotic cupcakes, I think the red, white and blue color scheme is very eye-catching. I love making fourth of July treats with my kids, the patriotic puppy chow would be a huge hit! Always a great snack. Some cool recipes here. How fun! And I discovered this just in time for the 4th of July! 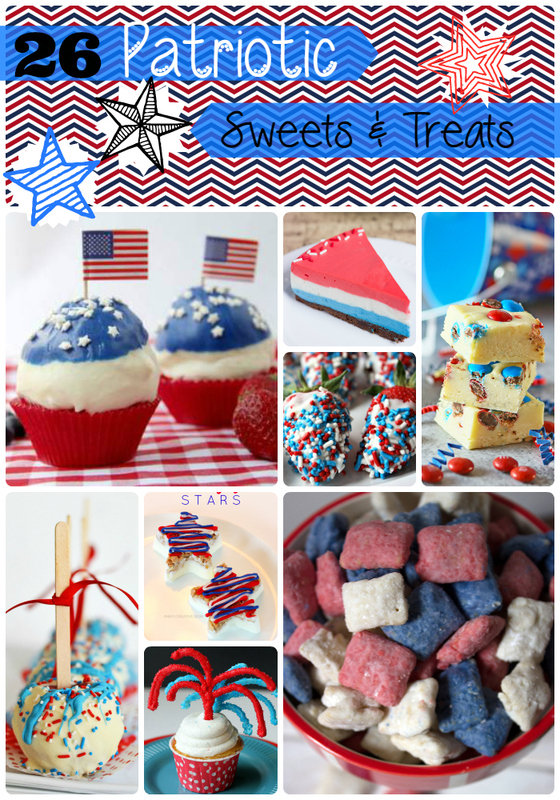 I like these patriotic sweets and treats ideas. I will probably be making the No-Bake Patriotic Marshmallow Cheesecake for the 4th of July.